I have to be honest, I’ve never been very focused on my heart. I mean, the tetralogy of fallot that I was born with was successfully repaired when I was 16 months old. That patch job held up for 26 years – much longer than my doctors had hoped for – and it hadn’t held me back from any activity. Even when my repaired pulmonary valve started to leak more and more during the last six months before my replacement, I was able to power through a tough half marathon, training runs, rock climbing, and probably a pint or two too many. More importantly, though, it kept on beating surgery after surgery, it kept pumping blood doctor’s appointment after doctor’s appointment, and it never failed when seemingly every other procedure did. In addition to my tet, I was also born with a bilateral cleft lip and cleft palate. Now sure, the heart condition was more of an immediate threat, but the clefts turned out to have a much greater impact on my life. The lip closed easily, but it left two scars that permanently marked me as different from everyone else. The palate, that…that was an ordeal. I underwent three major attempts to close the hole in the roof of my mouth, each with varying degrees of failure. Even on the last attempt – which took place in high school – it again broke open, but finally not enough to require another try. These attempts to close my lip and palate resulted in over 20 surgeries, too many days on a liquid diet, headgear during my senior year of high school, and more mental scarring than I ever realized. I fell in love with running. Originally, running served just as a warmup before lifting weights, but after a bit of research I found that cardiovascular exercise – when combined with a healthy diet – was the best way to trim those pounds I packed on after college. Soon, I started looking forward more to my cardio days than my actual lift days, and the warmup runs became longer and harder while the lift days came fewer and further between. What did I get from running that I didn’t get from anything else? Why did running eclipse lifting weights? I loved how I could actually realize what I did, how I could see the distance I traveled. Best of all, those miles were on me. All on me. I didn’t get help from spotters, machines, or wheels – or doctors giving me advice, or my parents driving me to Seattle, or teachers extending deadlines – but my success depended on just me: my own two feet, my own two lungs, and my own heart. Sure I graduated with two bachelor’s degrees, sure I got my masters, and sure I got a job in the field that I wanted to work in. But I got help with all of that. I got loads of help, and my lack of self-confidence that stemmed from my clefts always made sure I knew that. But not with running. It was impossible for my brain to credit my efforts to anything other than me. Running allowed me to recognize that my body, despite everything it had gone through, was powerful and good and something to be proud of. That it could carry me 13.1 miles. That it could conquer hills and thunderstorms and anything else that got between me and a good run. And what is running? It’s all heart. You can always go just a little faster, just a little farther, but you need to will yourself to do so. Your legs don’t make you stop, your arms don’t make you slow down. That drive to push harder, to go faster, to hold the finishing pace just a bit longer? That comes from the heart. Your heart can override all other signals your body is sending you and can push away the pain, and you most often come out better for it on the other side. That’s what my heart did for me. It kept me going when everything else was trying to get me to stop. It fought through pain and teasing and all kinds of bad emotions when I was young to make me a better person. It did all of that with a leak that slowly progressed over time, to the point where my pulmonary valve had to be replaced this past December. It fought for me and it overcame so much – it lasted 26 years on an 18-year repair – so I would be able to overcome my other issues. My heart valve took care of me during the first quarter of my life, and now it’s time for me to return the favor. 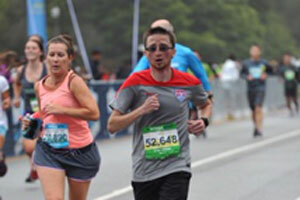 Postscript: While yes, running has helped my mental health tremendously, I’ve also been seeing a counselor and talking through my experiences, which has also provided amazing results. I recommend everyone undergoing medical trauma seek help. If you’re uncomfortable seeing a counselor, find a good friend, a loved one, or anyone you can be open and honest with to talk about your feelings. Keeping everything locked up isn’t healthy; I tried that for 20 years and it got me nowhere.